and for dumping Arnold so that we can work with teachers, students and communities to ensure adequate funding for our schools. However, the initiative would impose severe penalties for “misuse” of funds—a term not defined to distinguish between inadvertent errors and intentional illegal behavior; place new constraints on the use of the class-size reduction funds; and expand the role of the state Board of Education in “approving” textbooks. We need initiatives that are generated from parent, student and teacher input, not Top-Down initiatives from mulitmillionaires like Netflix mogul Reed Hastings, silicon valley venture capitalist John Doerr, and Gap founder Don Fisher, all advisors to EdVoice, the sponsor of Prop 88. Flat taxes like Prop 88 also let the fat cats like Hastings, Fisher and their friends off the hook for paying their fair share to our schools. 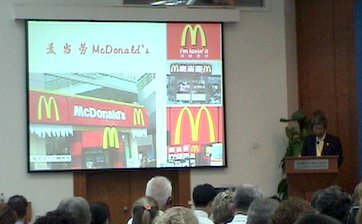 For more on EdVoice - see Duane Campbell's Choosing Democracy Blog - ED Voice; How corporate CEO's shape education policy. 3. Alliance for a Better California - largely funded by the California Teachers Association and other public sector unions - ABC has been proactively trying to build a stronger alliance between labor and our grassroots communities up and down the state. 4. League of Independent Voters [aka League of Pissed Off Voters] - mobilizing the 'sleeping giant' of young voters in chapters throughout the US [though local league folks got their butts kicked in a recent campaign for community safety alternatives to police, they will undoubtedly be back and hopefully more self-critical than ever]. What other local, regional and statewide efforts are folks watching? The Challenge of Superintendent Searches - Klonsky's SMALL TALK on Boston, Racism in Westminster, CA?, Which Way Forward for SF? Why can't urban school districts get their act together when it comes to leadership selection and development? It seems like the districts with the largest populations of poor families and children of color, like Cleveland, St. Louis and now Boston, can't seem to hire their leaders and when they do, they can't keep them for more than a couple of years. It's certainly not because of lack of money. Klonsky concludes: "Payzant [Boston's superintendent] will be a hard guy to replace at any rate. He was one of the rare ones who led reform, worked well with the teachers and still was able to survive for more than a decade. Remember his quote from my recent posting: "Small is beautiful, only if you take advantage of it." Currently, San Francisco faces a daunting task of also selecting a new superintendent in the next year. But we have the luxury of a little more time because we have a very capable Interim Superintendent - Gwen Chan - a 40 year veteran teacher and administrator in our district who is currently at the helm of SF Unified until July 2007. Racism in Westminster, CA search? 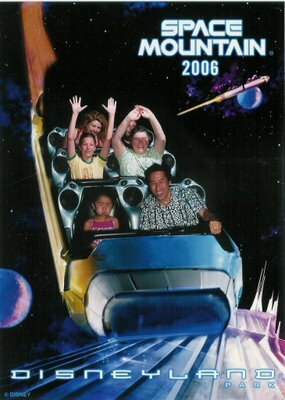 Since visiting the 'OC' this summer and staying in the Westminster/Garden Grove area near Disneyland I have been following the antics of the Westminster Unified Board of Education's May 3:2 decision to withdraw their earlier offer to hire Dr. KimOanh Nguyen-Lam, a member of the neighboring Garden Grove Unified School District Board of Education and Assoc. Director of the Center for Language Minority Education and Research at Cal State Long Beach. Nguyen-Lam would have become the first Vietnamese American superitnendent in the country. Dr. Nguyen-Lam is a former bilingual teacher for many years who speaks fluent English, Vietnamese, Spanish, and French. The district is 83% students of color, including 34% Vietnamese and over 39% Latinos. Sylvia Mendez, a retired nurse whose 1945 lawsuit against the Westminster School District ended [legal] segregation in California schools, was among the leaders of a protest staged outside council chambers Thursday night. "I understand how KimOanh feels and how all of our community feels," she said, "because my Mexican classmates and I too were told that we were not qualified — that we were not good enough or smart enough, when we knew we were capable of anything. I am back to join you who, like the parents who came together so many years ago at this very same district, are here to demand fairness for our children." See the recent interview with Nguyen Lam from Nguoi Viet. 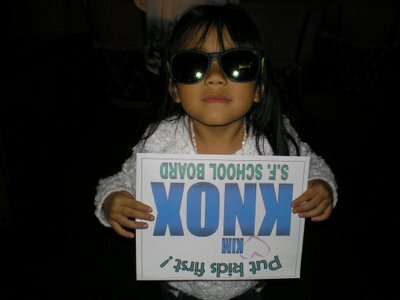 Latino and Asian American communities in Orange County now seem to be now focused on changing their school board. Like Nguyen Lam's community and student supporters I think that racism in Westminster is a key factor in the decision-making of the board, and I agree with Ms. Mendez that there is a clear connection with the historic 1945-47 Westminster case. Parent/Community Voices in Superintendent Searches - Strong parent and community voices in superintendent searches have been a challenge for districts like the 10,000 student Westminster Unified, to our 58,000 district in SF and other larger urban districts like Boston. But Boston's BPON [Parent Organizing Network] and others had demanded strong community input into their process, and it seems that someone involved in their search process leaked info to the Boston Globe and that unfortunately derailed their process. [for the record - I was called by several Boston Globe reporters, but I refused to comment on our former Superintendent and one of our current administrators that were reportedly being considered for the Boston Superintendency]. In San Francisco we are issuing an RFP for search firms for our superintendent search next week and I and other board members will be specifically looking for firms that have a track record involving parents and communities as key parts of the search process - especially parents like Westminster's Latino and Asian immigrant communities that have been disenfranchised since way before the 1945 Westminster case began to break down the legal barriers to unequal schools in our state. Click here for more historical materials on the Westminster case and www.mendezvwestminster.com - Mendez was a precurser to the much more widely known Brown v. Board of Education cases in 1954 and 1955. Lastly, congrats to one of our former Assistant Superintendents Dianne Talarico in her new appointment to head Santa Monica's school district. Hazard, Young, Attea & Associates, Ltd apparently conducted Santa Monica's search process. More Santa Monica Info. One of this summer's best experiences so far has been my time with students, parents, teachers and veteran civil rights social justice movement leaders and organizers brought together by Kathy Emery, Sherri Sawyer, Sandra Mitchell and others from the SF Freedom School. For the first session on JULY 8 - Intersection of Education and Civil Rights: Highlander and Organizing about 20 of us had a great time talking, watching films, eating - building the beloved community for the long haul... participants have come not just from SF and Oakland and Berkeley schools, but also from Watsonville, Concord, San Pablo, Richmond, and other areas as well. In last Saturday's sizzling heat we spent quality time with former SNCC staffer and Organize Training Center director Mike Miller, and longtime Chicano/Latino community leader Betita Martinez, also a former SNCC staffer from back in the day. Morning: Documentary Film: A Force More Powerful (30min, 2000; produced and directed by Steve York. Disciplined and strictly nonviolent, black college students in Nashville, Tennessee, successfully desegregated the downtown lunch counters in five months, becoming a model for the entire civil rights movement. )Morning and Afternoon Guest Speaker: Civil Rights Movement veteran Bruce Hartford (CORE, SCLC 1963-67, Alabama, Mississippi). Bruce will give his workshop on the "Key Concepts of Nonviolent Direct Action." AUGUST 12, Arts and Protest: How does art foster protest? Hermosa Beach, Redondo Beach and Manhattan Beach - weather is heavenly out here. Loved the amazing sunset yesterday at Manhattan Beach; and the morning sunrise at Hermosa Beach pier today. And this afternoon I am visiting Santa Monica Pier with my 6 year old Jade and visiting my sister in Pacific Palasades as well. Back home driving up I-5 tomorrow morning through the blistering Central Valley to the SF/Oakland Bay Area and cool summer weather again. This Great Wall photo shows Ben Liao of Cupertino Unified School District, and also the head of the Asian and Pacific Islander School Board Members Association. To the far right is Sally Stewart, former president of the California School Boards Association - CSBA http://www.csba.org and a member of the Sequoia Union School District on the peninsula between SF and San Jose. Shanghai grandma and little boy. 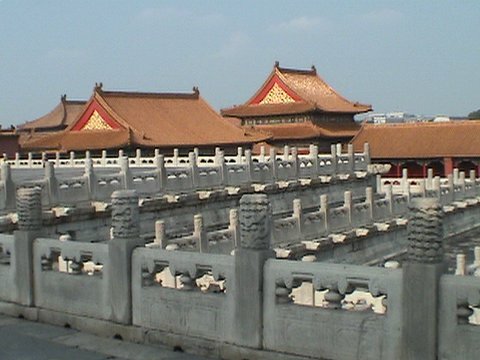 A shot from the amazingly modern and traditional Beijing skyline. There were more cranes building new skyscrapers, often 5-10 at a time, in the Beijing sky than I have ever seen. If the Manhattanization of San Francisco in the last 10 years has been a concern, Beijing is like unchecked development or globalization on steroids. It really has become the wild wild east, for multinational corporate development. 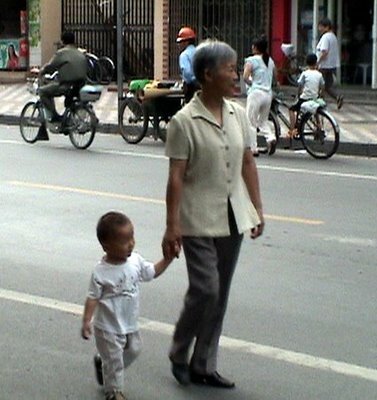 In my Jooksing in the Motherland blog I just wrote a little more about the Chinese educational system and my thoughts on rewatching Carma Hinton's documentaries Morning Sun and the Gate of Heavenly Peace. The photo below shows Jinan students engaged and active in learning the English language. The Chinese government has made English language classes mandatory in their curriculum. 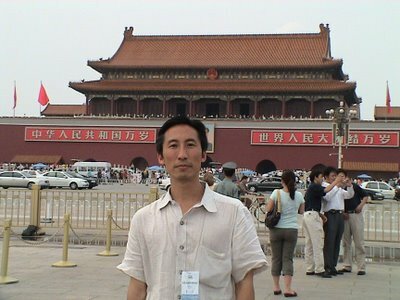 BREAKING NEWS - filmmaker Hao Wu was released yesterday and is finally free after 5 months in prison. 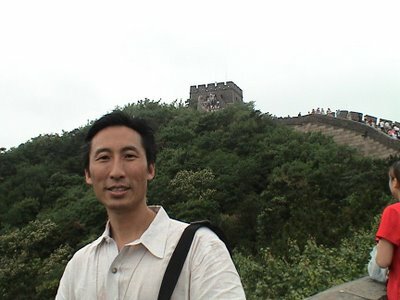 His Beijing or Bust documentary highlights a number of Chinese Americans, including business people, artists and musicians, who are living in China. It's Miller Time, I mean Baijiu time - done with grading students' papers for the summer! I am done with grading my SF State students' final research papers and now free for the summer. 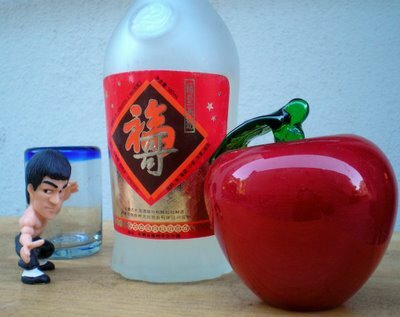 Baijiu is the Chinese liquor I developed a 'taste' for while in Jinan, China. My grades for the 6-week summer session course I taught at San Francisco State this past June and July are due at midnight this evening. Because of my heavy commitments as a big city board of education member and my quick trip to China I am just finishing up my grading now. The 40 students are anxious to get their grades. I am impatient to get on with my summer vacation. 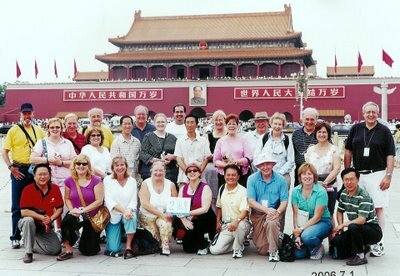 On June 30th some 17 years after the Tiananmen Square Massacre our educators delegation from the United States toured the Great Hall of the People, and took plenty of photos in Tiananmen Square with Mao looking over our shoulders from his 22 foot high portrait which hangs from the massive Gate of Heavenly Peace, the entrance to the Forbidden City of Chinese emperors. 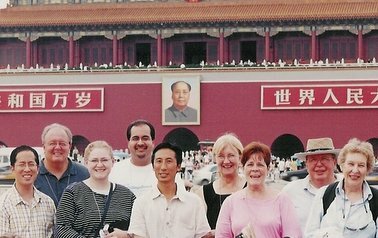 Carma Hinton's insightful 1996 film The Gate of Heavenly Peace and the companion website gives a very good modern overview of the political shifts in China up to the mid-1990's when the film was done and info on the student leaders from Beijing Normal University, which we visited, and Beijing University. 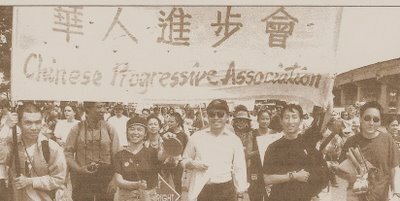 My involvement in educational justice work began when I joined the Chinese Progressive Association in SF's Chinatown in 1984. My twin brother Gordon [in the picture on the far right] had been active in the Asian Student Union at UC Berkeley and joined CPA a few years earlier. He is now the Executive Director. Former Emeryville Unified Superintendent Henry Der is to my right, in the middle of the photo. At the time Henry was director of Chinese for Affirmative Action. He is now a senior program office for the Evelyn and Walter Haas, Jr. Fund. Burton High School teacher Eric Chow is to the far left. In 1987 CPA organized thousands of students, parents and community folks to March on Sacramento for bilingual education, Ethnic Studies, adequate funding, equal opportunities to learn and against the racism and anti-immigrant sentiment of the period. My wife and I continued to support summer youth programs in Chinatown and youth leadership in the Environmental Justice movement as well into the 1990's. We also dabbled in electoral politics during the Rainbow Coalition campaigns of 1984 and 88 as well, and learned to "wield the weapon" of electoral politics to help build stronger social movements for a more democratic and just society, as one of our leaders Wilma Chan used to say. Wilma is now in the California State Assembly. CPA also sparked my interest in US China relations, fighting against anti-Asian violence, and connecting immigrant rights and workers rights and economic justice for our communities. CPA continues to do amazing multiethnic alliance building, immigrant rights, tenant empowerment, low wage worker organizing, and anti-globalization work as well. 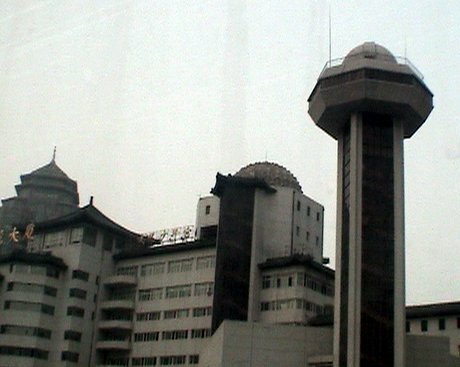 Beijing July 1, 2006. Our educators delegation to China included about 400 people. Our smaller groups - pictured here - was made up of a number of principals, teachers, world language department heads, a couple of superintendents, and the Superintendent of Public Instruction from the state of West Virginia. While our group visited schools in Shandong Province [between Beijing and Shanghai], other SF Unified folks visited Shanghai and a few other provinces. For more - see jooksing in the motherland - my blog for the China trip. 70,000 Oaxacan teachers in Mexico continue their fight for dignity and better wages which began May 16 - for more info see filmmaker Jill Friedberg's Granito de Arena website www.corrugate.com . Friedberg reports that the PRI, Mexico's dominant centrist political party lost for the first time in history lost in Oaxaca with 9 out of 11 districts voting for the candidate of the PRD, the left party which was supported by many of the teachers and the communities supporting their struggle. 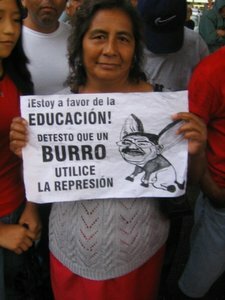 This weekend rural teachers will be returning to their communities to finish the school year and to engage with parents and communities, encouraging them to return with them to the Oaxacan encampment on July 22nd where they have committed to stay until the repressive Governor of Oaxaca steps down. On July 24th Oaxacans celebrate their Guelguetza, an annual celebration and festival of indigenous people's art and culture. The schools we visited in Jinan, the Capitol of Shandong Province in China on Monday seemed better-resourced than many of our schools in the San Francisco/Oakland Bay Area. Today I met with San Francisco middle school students who will be entering many of our high schools next year like Lowell, Galileo and Lincoln. A few are going on to private and parochial schools as well. The students are participating in a great program called SummerBridge. The 2 Jinan schools we visited, Jinan Primary School and Jinan #2 High School, were both probably that city's showcase schools, like Lowell or School of the Arts High Schools are here in SF. We didn't see the regular schools, especially those that the 'common people' attend in Jinan. Despite China’s stunning economic progress, annually there are still more than 3 million kids drop out of elementary and junior high school. The majority of these drop-out kids are girls, which means that their future children are more likely to miss the opportunity of education as well. China's dropouts or "pushouts" as some of us call them are as invisible there as they are here in San Francisco schools. Education Week in their Diplomas Count report and the NY Times have noted that more than a third of high school dropouts across the nation leave school without ever going beyond the ninth grade. And, while some try to constantly downplay this crisis, the numbers for Native American, African Americans and Chicanos/Latinos are even more alarming. See SF Schools Blog for more. Given China's huge population [even in Jinan, one of China's lesser known urban centers with about 5 million people, the school system was larger than Los Angeles Unified] the figure given by Wen of 3 million students dropping out in that huge nation is probably a much lower rate than that of California or especially in our urban districts like San Francisco, Oakland and Los Angeles. At some point I hope to visit schools in China in the rural areas, and those in the City that are not the Party's showcase schools. On the Great Wall - I actually walked my way up a good part of one of the pieces of the wall outside Beijing. In front of the gate of heavenly peace. 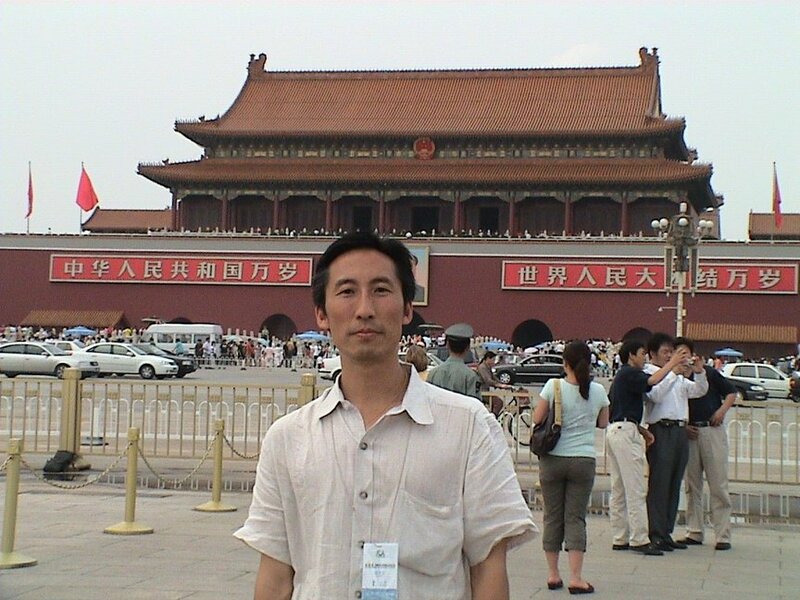 My head is blocking Mao's 22 foot oil paining image. 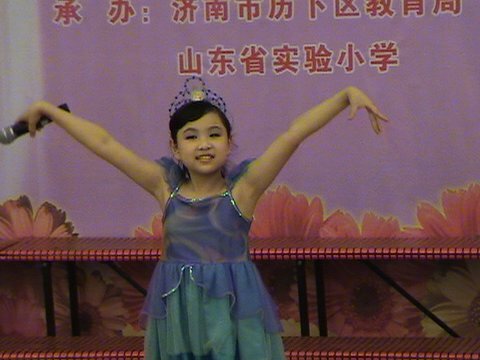 A performer at Jinan Primary School, a 100 year old school in the Capital of Shandong Province.